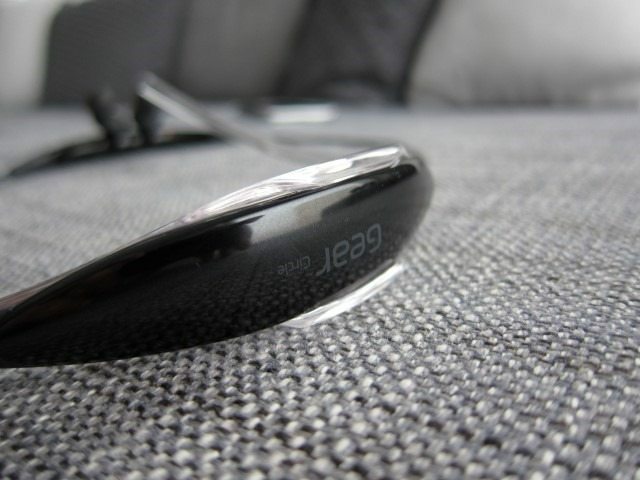 Samsung’s “Gear” devices, is a wide ranging category of wearables and while their Gear watches and the Gear VR are well-known, the Gear Circle is not. Perhaps it’s because it’s not on the bleeding edge like VR and smartwatches and belongs in the more matured and saturated market of Bluetooth headsets. Is the Circle another forgettable Bluetooth Headset in a market where the Jaybird X2 reigns supreme? 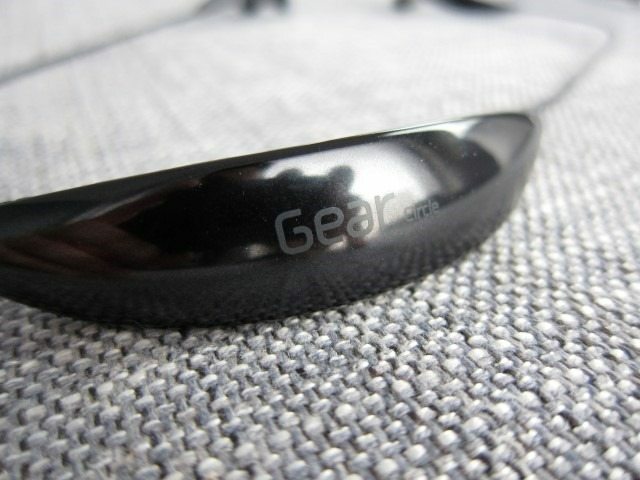 The Gear Circle is a Bluetooth headset and comes according to the Samsung’s website in either White or Blue, but we were able to get our hand on a Black model. So if you’re set on getting that color, they’re out there, but strangely just not mentioned on Sammy’s website. The “Circle” name comes from the fact that there are magnets on the earphones, allowing them to perfectly attach to each other and form (you guessed it) a circle. 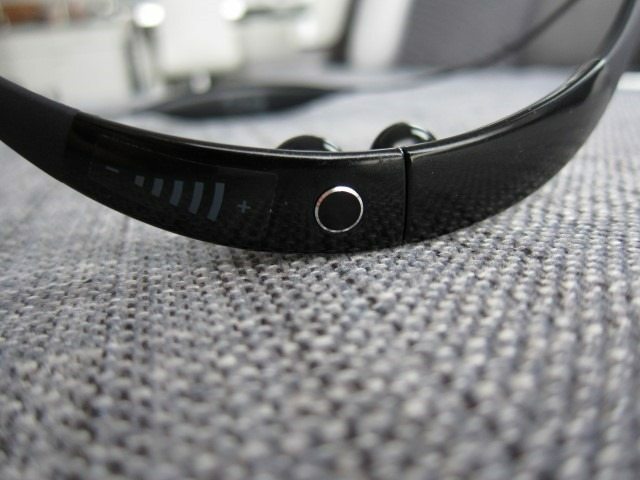 While “Bluetooth” is generally the headline feature with most Bluetooth headsets, the Gear Circle follows Samsung’s general philosophy of including everything but the kitchen sink, the Circle not only uses a wireless Bluetooth connection, it also has touch controls, a vibration motor, magnets to attach the earphones to each other, magnetic sensors (Hall Sensor) and high quality voice notifications. 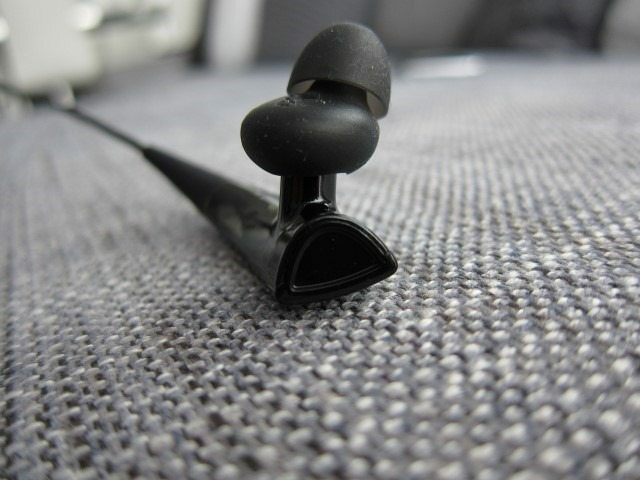 All those features do come at price though, in terms of it weight, as it not only weighs a hefty 28g(for earphones atleast), which more than double the weight of a Jaybird X2, and as a result it requires a neck guide. 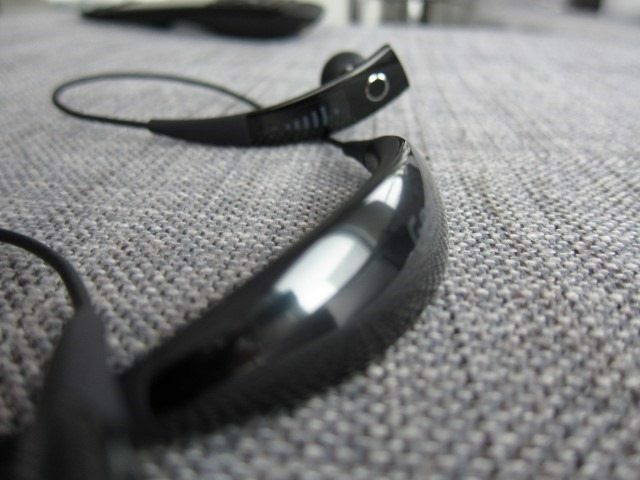 While Samsung recommends wearing the neck guard for “outdoor activities”, in reality you will almost always need it: the module hanging behind your neck is heavy enough, that eventually gravity will start to take over, pulling the module downwards, which in turn will start to pull on the earphones themselves. Inside the package you’ll find the usual 3 sizes of the rubbery earbud tips, 3 sizes of the neck guides which is something I’ve never seen before included with earphones and what looks like a standard Samsung charger, 5V with a fairly low 0.7A. The Gear Circle is done in a shiny Black finish that thankfully doesn’t show fingerprints as easily as one would have expected. This might seem like a trivial matter, but not having to wipe down your gadgets due to the simple act of touching them is a definitely appreciated. 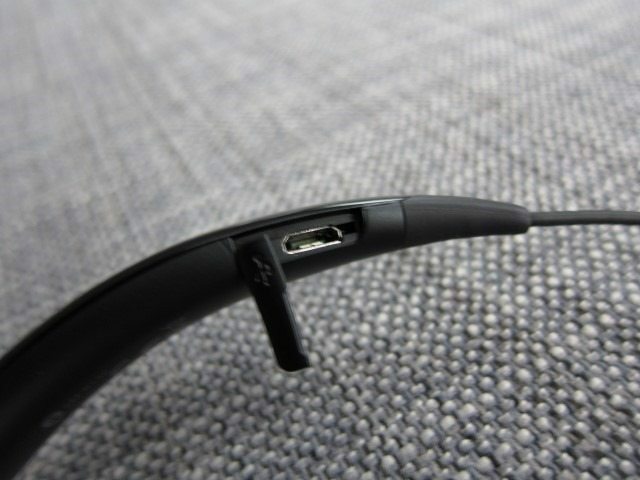 The Circle consists of a three parts: the module that goes behind your neck, the left earphone module and the right earphone module. The module that goes behind your neck not only houses the charger port and charging circuitry, but also the rather large 180mAh battery (an X2 has 100mAh) and the vibration motor. The vibration is quite strong and will vibrate similar to a phone when receiving calls. This module sticks out like a sore thumb. 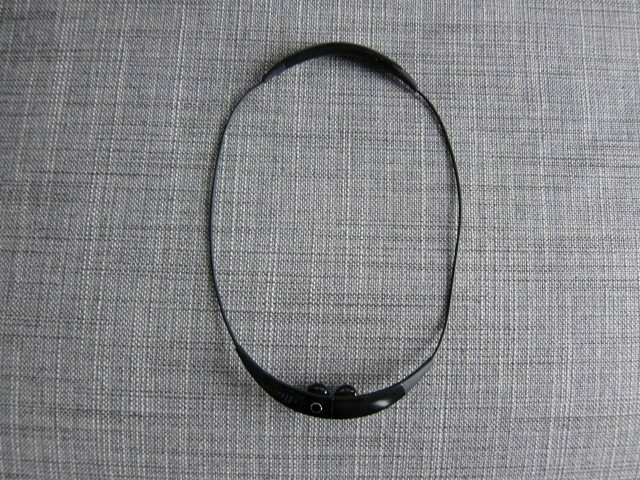 It is the reason why a neck guide is needed and accounts for much of the Circle’s extra weight. While it does almost double the battery capacity of the Jaybirds, the Jaybirds are still able to achieve 8 hours of playback time with 100mAh. 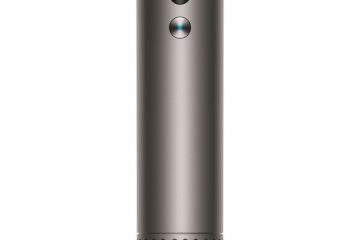 Admittedly the vibration motor quite unique selling point and can be handy for some and the battery life is really, I would have sacrificed the complexity, weight, battery life and just rely on the voice notifications. This would have also done away with the neck guides. The earphones themselves actually sit on the inner side of module that looks like a shark’s tooth, giving them this “floating” illusion. This module has this same shiny finish as the behind-the-neck-module and have an angular design that slightly curves inwards. At the end of the module there’s an integrated magnet that allows the two to attach to each other. I liked the fact the fact that the ear tips are replaceable, removable and washable and was surprised to even see a tiny reflex port. The left earphone only houses the power button, while the right earphone has the touch volume controls, a multipurpose button, microphone and status indicator light. It is a bit odd having the status indicator light on a different earphone than the power button. Ideally, they should have been on the same earphones. 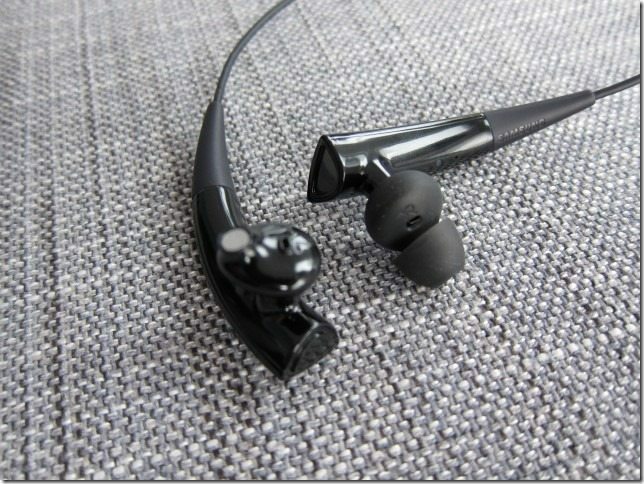 Both the earphone and the earphone module are very rigid, hence non-adjustable. In my case I found the fit extremely comfy, but I’m sure that for some people it’s not. I just wish that in some ways it was at least a bit adjustable. 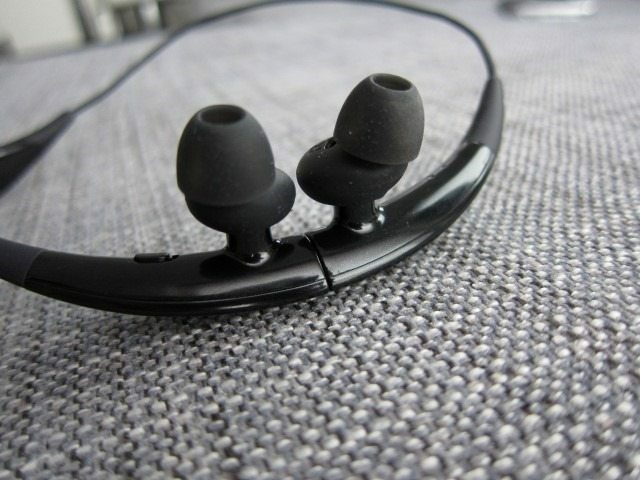 I like to push my earphones just a bit more in to get a tighter seal, but the rigid design didn’t allow for that. Only kind of adjustment you’re getting here is choosing what size of earbud tips you want to use. Overall the Circle looks modern, includes many unique features and large battery, but the large module in the back shouldn’t be there. Sacrificing the vibration motor and smaller battery could have done away with the neck guide. The earphones are very comfy and the neck guide is a must. 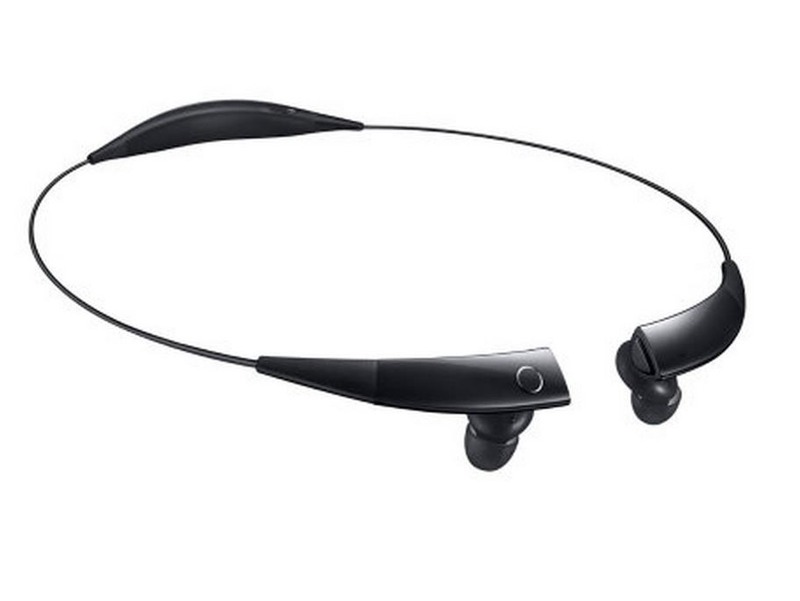 Usually we don’t talk about software when talking about Bluetooth headsets. The Circle will work just like every Bluetooth headset out there, but using Samsung’s Gear software you actually get some extra functionality. 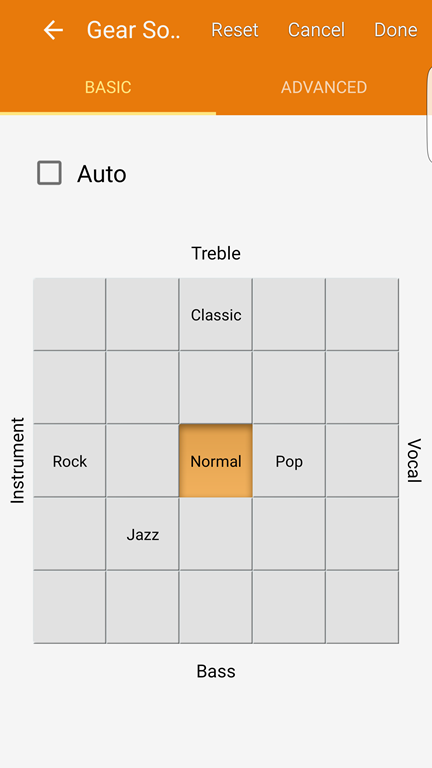 This includes a battery status indicator, the ability to adjust the sound using presets and a basic equalizer. 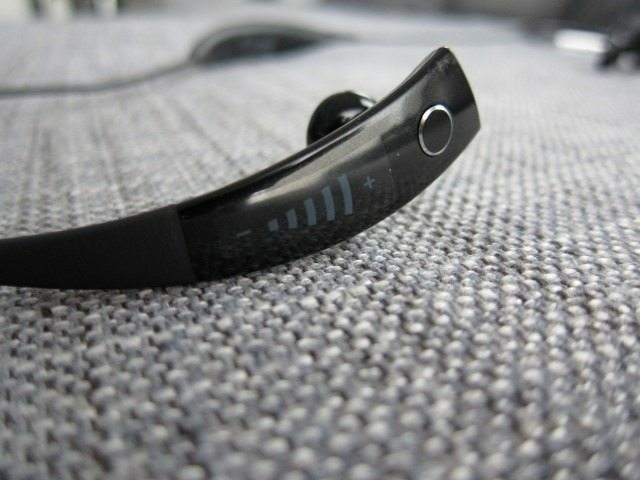 Another plus is the ability to get both voice notifications in addition to vibrations when receiving calls. 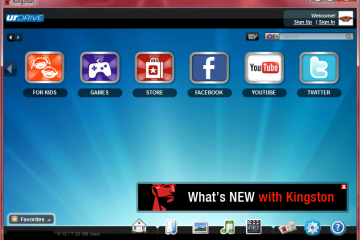 Here you can even customize which apps will get notification and whether it gets detailed or simplified notification. With WhatsApp for example, if you have simple notification turned on, you will simply hear “WhatsApp” when you get a new message. Having detailed notifications, it will tell you that you got a new WhatsApp and who send it. 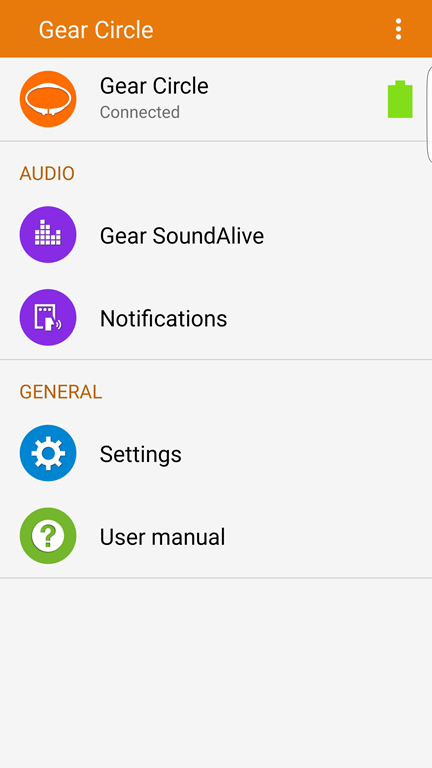 It’s cool and can be handy, but if you’re listening for music (the main reason for getting a Gear Circle) it can become annoying very quickly, especially if receive a lot of notifications. I now only have notifications turned on for incoming calls, missed calls, alarms, schedules and messages. Having notifications for all other app became way too overwhelming. It also cuts out the music to make its announcement, which just pulls you out of the whole experience. Handy however, is that they allow you to limit notification when using the phone or simply turn notifications completely off and simply enjoy the music. 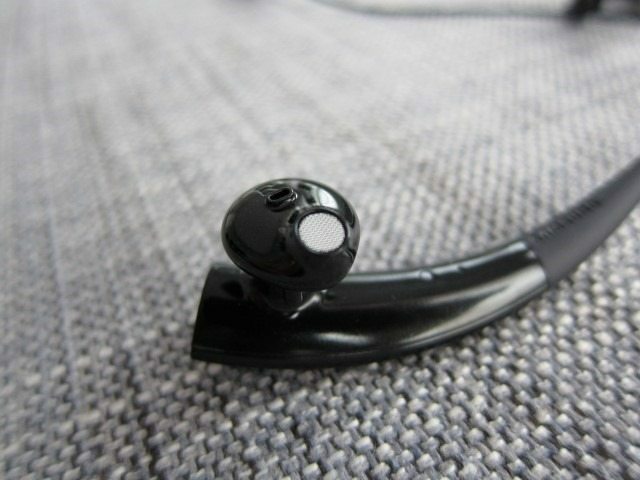 There’s also the option to pause media by putting the two magnetic ends together and voice control. There’s also a digital user manual available if you go the Samsung Gear software route. But perhaps the most interesting feature you get by using the Gear software is the Volume Monitor. 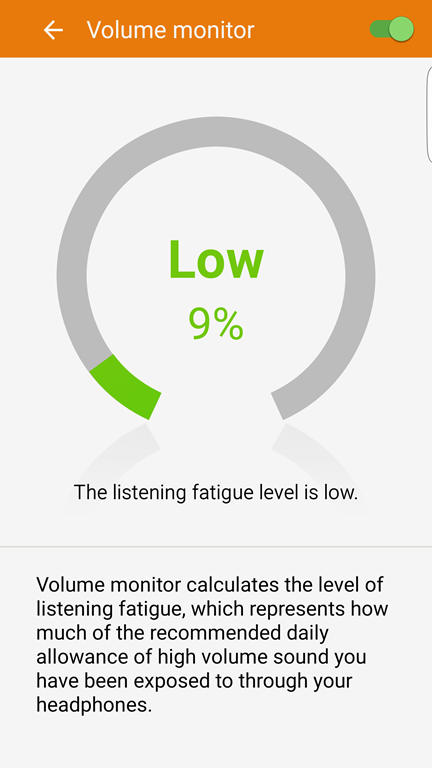 It basically calculates the listening fatigue, using the volume and how long you listen. It can recommend you. Having a neck guide is simply weird, it’s effective, but weird. 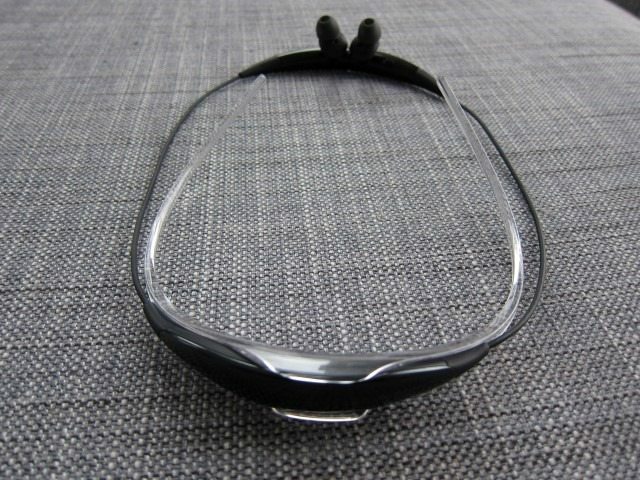 One thing is for sure with the neck guide this thing isn’t coming of, but it takes away from the futuristic clean design of the headset. Design-wise what I liked the most is how the two earphones can attach to each forming a kind of necklace instead of aimlessly dangling around. When it forms the circle, sort of like a necklace it actually cool, like something will be wearing in 50 years, but it’s the neck guide that ruins the overall look. Even cooler is hearing your music stop by simply bringing the magnets together. Despite me hating that module that hangs behind your neck, I sometimes came to love it when it comes to battery life, easily getting 16 hours of battery. About twice what other lighter and smaller Bluetooth headsets can achieve. If you’re getting this thing it’s for the battery life, it’s amazing. 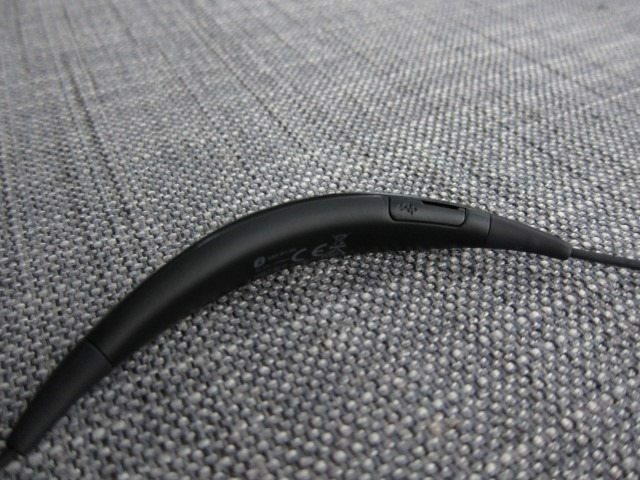 Now for the most important element of any Bluetooth headset, the sound. The sound signature of the Circle can be defined as very balanced, neutral and effortless and effortless performance. 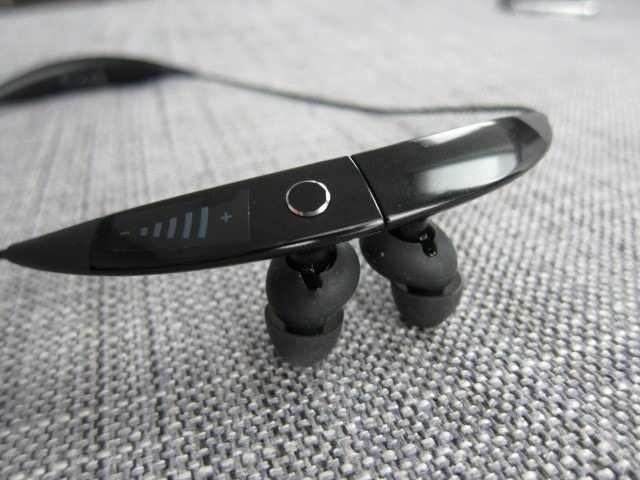 Its performance was effortless, without a single sign of strain, all while keeping one of the most balanced I’ve heard in a Bluetooth headset. Usually there is an unnatural extra base, but Samsung has resisted the temptation creating a solid base that very well balanced when compared to the mids and highs. The mids and highs are also perfect, again very balanced. The only thing I wished for is that volume could go a tiny bit higher. When the Circle can go up to 90, the X2 will push it up to 110. Sometimes you just want to blast the sound a bit higher and it misses that extra volume headroom. 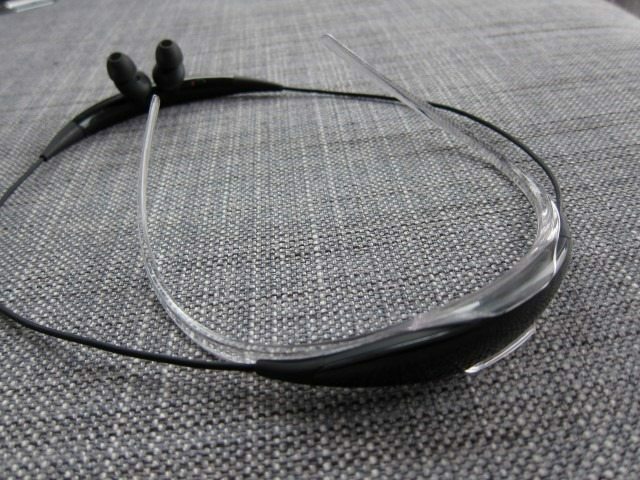 Mids are so natural, airy and again one of the most balanced performances I’ve heard on a Bluetooth headset. The high aren’t perfect and could be a bit pronounced. 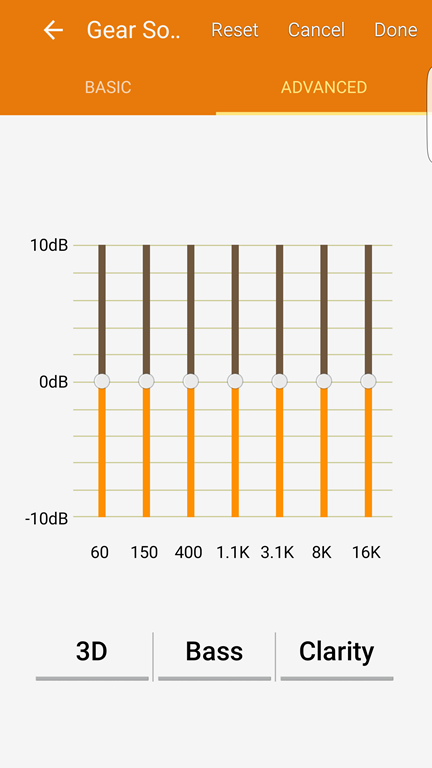 The X2 sounds louder more dramatic, while this has less volume and a more balanced sound. If this had a higher volume headroom the X2 would have a real problem. Samsung did an excellent job hear and should be applauded for the audio quality. The weakest point in the Gear’s armor is surprisingly it’s wireless performance: get a little far from your phone or let a wall get between you and the phone and it falls on its face. Even the smaller Jaybirds did better. For a headset of this size, I would have expected a lot more. The Gear Circle follows Samsung’s general philosophy of including everything but the kitchen sink and is probably one of the most feature-packed headsets around. All those features do come at price though, in terms of it weight, as it not only weighs a hefty 28g(for earphones atleast), and as a result it requires a neck guide. 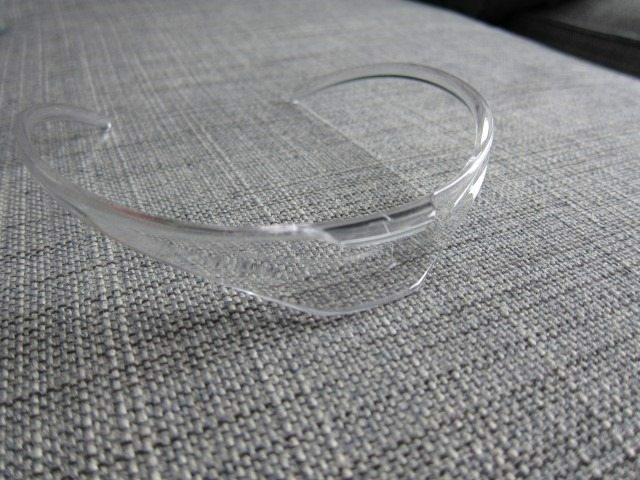 While Samsung recommends wearing the neck guard for “outdoor activities”, in reality you will almost always need it. 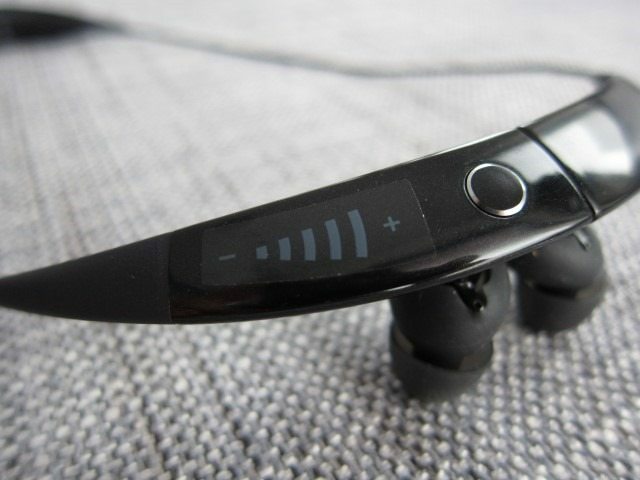 With around 16 hours of battery life it has almost twice the battery life of Bluetooth headset of this size. It excels, when it comes to audio, but just be aware that you’ll always need the neck guide and wireless range isn’t the best. The Circle is a mix of unique feature, great performance with some quirkiness that makes it unique. It gets a 9 out 10. Wireless range is lower than the average.